One of the best ways to ensure clean water for future generations is to educate our children on the importance of water treatment. One good way to become better educated about water treatment is to visit your local water treatment plant. The Appomattox River Water Treatment Plant in Petersburg, Virginia welcomes visitors. To schedule a visit, please submit the plant tour request form. The U. S. Environmental Protection Agency (EPA) has several educational pages and links for kids, including links to Bill Nye-the Science Guy and Eddie the Eco-dog. Visit these EPA pages to learn more. Fun Fact: How did Lake Chesdin get its name? 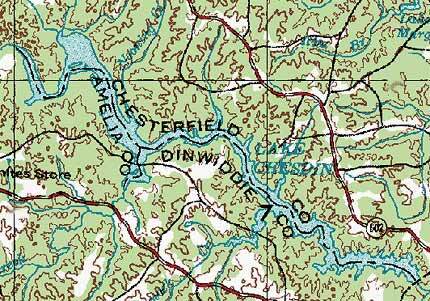 Answer: Lake Chesdin is a large man-made lake located between Chesterfield and Dinwiddie Counties, thus the name Ches-din. The following links are provided for your information and education. The Appomattox River Water Authority does not guarantee the accuracy or relevance of off-site links. AWWA – American Water Works Association – An international nonprofit scientific and educational society dedicated to the improvement of drinking water quality and supply. Virginia 811 – Virginia 811 is the “one stop” Virginia communications center for excavators, contractors, property owners, and those planning any kind of excavation (digging) or demolition. Virginia 811 advises ALL affected parties to call prior to digging. Notifying Virginia 811 before you dig is the LAW! VDGIF – The Virginia Department of Game and Inland Fisheries is responsible for the management of inland fisheries, wildlife, and recreational boating for the Commonwealth of Virginia. The Department has an operational budget of approximately $51 million. VRWA – Virginia Rural Water Association – The vision of the Virginia Rural Water Association is to be the leading professional organization that adapting its assistance and training to ensure services exceed the ever-changing needs of its members. VWEA – The Virginia Water Environment Association, Inc. – Mission Statement: To preserve and enhance Virginia’s water environment, now and for future generations. WEF – The Water Environment Federation is a not-for-profit technical and educational organization representing water quality professionals throughout the world. WEF and its member associations proudly work to achieve our mission of preserving and enhancing the global water environment. Well and Groundwater Testing – Although a certified testing laboratory, the Appomattox River Water Authority does not provide testing services for residential drinking water, wells, or groundwater. Certified laboratories that do provide these services include: http://www.wellwater.bse.vt.edu/ and http://www.wellowner.org/. Additional information pertaining to Virginia Household Water Quality Program is available here. The EPA guide, Drinking Water from Household Wells. is available here. EPA – U. S. Environmental Protection Agency – The mission of the Environmental Protection Agency is to protect human health and the environment. Since 1970, EPA has been working for a cleaner, healthier environment for the American people. DEQ – Virginia Department of Environmental Quality – The Department of Environmental Quality aims to protect and enhance the environment for the benefit of the public. The Appomattox River Water Authority provides the following Policy Statements for the convenience of our visitors, customers and other interested parties. The Appomattox River Water Authority provides the following forms for the convenience of our visitors, customers and other interested parties. The Appomattox River Water Authority provides the following documents for the convenience of our visitors, customers and other interested parties. The Appomattox River Water Authority provides the following studies for the convenience of our visitors, customers and other interested parties. The files above are available in .pdf format (Portable Document Format), which can be read with the free Adobe Acrobat Reader. The Adobe Acrobat Reader is likely to be installed on your computer already. If you need to install a new or updated copy of the reader, please click the Adobe Reader button, below. Copyright 2019 © The Appomattox River Water Authority (ARWA). All Rights Reserved.